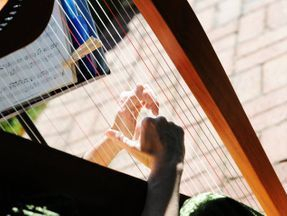 Jen Carlson Midkiff got her start in Irish music when she started harp lessons in college: her teacher used Irish tunes and early music as her teaching materials. She was hooked on the sound after the first time she heard a Chieftains CD, and has been playing Irish music (among other styles) ever since! Jen has attended workshops with clinician, performer, and multiple All-Ireland harp winner Grainne Hambly, and has researched harp style independently and through her involvement with two Celtic-influenced groups, Alair and Wild Mercy. Alair is a traditional Celtic trio, using harp, flute, bodhran, guitar, and vocals to bring both trad tunes and Irish song to their audiences. Wild Mercy is more eclectic, with Celtic, folk, and jazz influences. Jen released her first solo CD last year, All in Good Time, available from CDBaby, Amazon, and iTunes, in which she uses both Irish and pedal harps. She teaches at Brebeuf Jesuit Preparatory School and also plays solo harp for weddings and other events in the central Indiana area.